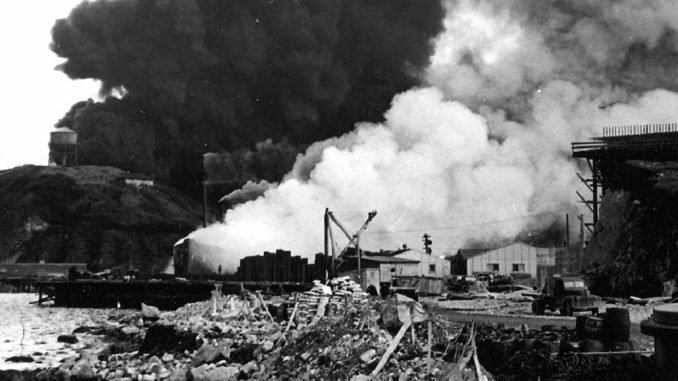 Often described as a diversionary attack to draw American forces away from Midway, the Japanese attack on Dutch Harbor on the 3rd and 4th of June, 1942, was in fact a distinct operation. The Japanese Army had long desired a presence in the Aleutians in order to protect the Home Islands from any possible incursion by American aircraft and submarines from the north. By occupying the uninhabited but strategically located islands of Kiska, Adak and Attu, Japanese forces could detect any incoming air attacks that might attempt to reprise the Doolittle Raid, as well as basing anti-submarine forces there. More fanciful planners also thought that an offensive through the Aleutians might also lead to an invasion of Alaska and then the continental United States. For the Navy though, the mounting of Operation AL was primarily the price that had to be paid for Army support of the Midway operation. Despite the bulk of the Japanese Navy being assigned to the Midway operation, substantial naval assets were available for Operation AL. Led by Rear Admiral Kakuji Kakuta, the Dai-ni Kido Butai, or Second Mobile Striking Force, consisted of the small carriers Ryujo and Junyo and their escorts. Ryujo had already seen extensive action, supporting the occupation of the Philippines and the Netherlands East Indies, as well as sortieing into the Indian Ocean in April 1942. Junyo however was brand-new, having recently completed conversion from a passenger liner. Between them, the two carriers were home to 40 A6M Zero fighters, 21 D3A Type 99s and 21 B5N Type 97s. 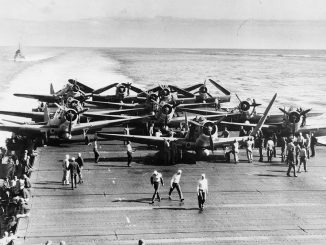 the carriers were escorted by three cruisers and five destroyers, with other surface vessels tasked with supporting the landings on the three target islands. The main American base in the Aleutians was at Dutch Harbor on the island of Unalaska. This small port was home to a small garrison of troops, including the US Army’s 206th Coast Artillery Regiment with several batteries of 3-inch anti-aircraft guns. There was a small seaplane base capable of hosting a few flying boats, but no airfield. Two airstrips had been secretly constructed at Cold Bay and Fort Glenn, respectively 180 miles and 60 miles distant from Dutch Harbor. These were home to fighters of the Eleventh Air Force, the newest and smallest of the USAAF’s overseas air forces. The Eleventh had a strength of just 4 heavy bombers (two old B-17s and a pair of LB-30s), 31 B-18 and new B-26 medium bombers, and several squadrons of P-40s – including a pair of squadrons from the Royal Canadian Air Force. 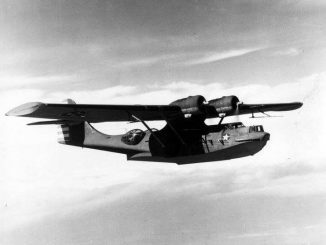 The US Navy contribution to the air effort was in the form of Fleet Air Wing 4, consisting of VP-41 and VP-42 with twenty PBY Catalinas. All of the flying boats were equipped with the ASE radar, whilst the four USAAF heavies sported the similar SCR-521 – sets which would prove useful in the foul North Pacific weather. The 2nd Kido Butai arrived south of the Aleutians late on the 2nd of June, 1942, and prepared to launch strikes early the next morning. The arrival of the Japanese was not unexpected – the American forces had been alerted by the same intelligence that warning of the impending Midway attack, and on the 2nd a patrolling PBY provided confirmation when it sighted the fleet 800 miles from Dutch Harbor. Japanese submarines were also busy flying reconnaissance missions: an E9W from I-9 overflew Kiska, Amchitka, Adak and Kanaga, another from I-19 reconnoitred Bogoslof Island, and an E14Y from I-25 flew over Dutch Harbor itself, reporting several cruisers and destroyers in the port. The morning of the 3rd of June saw the Japanese carrier force mired in very poor weather which delayed the takeoff. Even when the weather did clear, one Ryujo B5N was lost on takeoff, but crew was recovered by a destroyer. Heavy cloud cover prevented regimented formation flying, requiring individual divisions to make their own way to Dutch Harbor. The Junyo contingent would never manage to find the target – the escorting fighters saw another PBY out on patrol and veered away to shoot it down, and then failed to re-join their bomber charges. The Ryujo attack group was then picked up on the SC radar of the seaplane tender Gillis, which radioed a warning to Dutch Harbor and prompted the six ships in port to get under way. Meanwhile, P-40s were scrambled from Cold Bay, 180 miles away, but they would not arrive in time to challenge the attackers. The Ryujo force broke into clear air just south of Dutch Harbor, opposed only by the 206th’s anti-aircraft batteries. A PBY was just taxiing on the water before beginning the daily mail run to Kodiak, and it was attacked by strafing Zeros. Two passengers were killed and the pilot had to drive the aircraft onto a convenient beach to escape. A second PBY managed to get airborne, harassed by more fighters, and escape into a nearby cloud – but not before it damaged one of the Zeros, which would soon have important consequences. The bombers meanwhile concentrated on Fort Mears, the conspicuous Army base, and bombed a barracks building – 25 men within were killed. Another bomb hit the nearby Russian Orthodox church, which was thankfully empty, and the Navy radio station took a near miss which shook the occupants but did not affect their ability to communicate. None of the ships in the harbour were hit. Despite what was reported to be ‘heavy’ AA fire, none of the attackers was brought down immediately. One of the three Zeros to arrive was damaged attacking the PBYs, in what would prove to be a momentous piece of fortune for the Americans. The fighter piloted by PO1c Tadayoshi Koga was holed in the fuel tank, and Koga realised he would not be able to make it back to the Ryujo. He elected to crash land on nearby Akutan island, hoping to be picked up by a nearby submarine positioned to rescue stranded pilots. However, on touchdown Koga’s fighter flipped on its back, and Koga himself suffered a fatal broken neck. His fighter remained undiscovered until 10th July, when a patrolling PBY sighted it. A recovery crew found that the Zero was almost intact, and it was soon shipped back to the United States for evaluation – an intelligence boon for the Allies. The Junyo formation, having failed to find Dutch Harbor in the murky conditions, flew over a small group of American destroyers moored in Makushin Bay to the west. These ships had been positioned as a strike force to challenge any attempted landing on Unalaska. 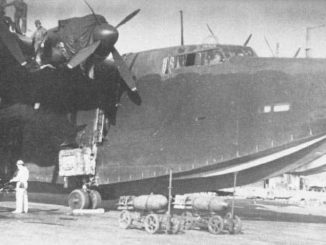 Lacking the anti-ship bombs and the fuel to make an attack, these planes flew back to Junyo to refuel and re-arm, before setting out in an attempt to re-locate the ships. To cap an awful day for the frustrated aviators, they again failed to find the target and returned to base empty handed. Even worse was the experience of four cruiser floatplanes from Takao and Maya, which were sent to reconnoitre Umnak Island. These got lost in the bad weather, and strayed near to the secret airfield at Cold Bay. P-40s were scrambled to intercept, and they shot down two of the scouts. A flotilla of American warships, Task Force 8, had departed Kodiak under the command of Rear Admiral Robert Theobald in order to confront the attack. However, Theobald needed confirmation of the location of the Japanese carrier force before he could engage, and so Patrol Wing 4 was ordered out on a search mission. However the PBYs were mainly sent north into the Bering Sea to find the enemy, misled by the withdrawal of the Dutch Harbor attackers in that direction. Only two flew to the south west, both of which found the carriers. The first PBY was shot down by the combat air patrol, and although several of the crew escaped into liferafts, some of them died of exposure. Three survivors were later picked up by the cruiser Takao. A second PBY was also attacked by Zeros and forced to crash land, but the crew were rescued by an American patrol boat. Neither Catalina had managed to make a contact report. The following day the search resumed. The weather was again terrible, and a PBY on night patrol in a notably stormy area failed to return, with no trace ever found of the crew. Another flying boat was more fortunate – at 0900 the radar operator got a contact, 160 miles south west of the seaplane base at Umnak. The plane was on its return leg and despite a dwindling fuel supply, the crew counted the contacts, reported them back to Umnak, and got an acknowledgement before heading back to Cold Bay with minimal fuel remaining in the tanks. This turned out to be the most important contact report of the day, pinpointing Ryujo and Junyo for the waiting strike force. The first PBY sent out from Dutch Harbor to amplify the contact was loaded with a Mark 13 torpedo and a pair of 500lb bombs. This aircraft also relied on its radar to find the Japanese in the appalling weather. The pilot radioed a contact report and then began an attack run, but the aircraft was badly damaged by anti-aircraft fire and had to jettison its ordnance, returning to base on one engine. A third PBY also found the 2nd Kido Butai on radar, and intended to guide Army B-26 bombers in to the attack. Instead the aircraft was found by the combat air patrol and shot down. Eventually, the Army bombers managed to find the Japanese carriers independently, although the bad weather meant that the formation was badly separated. A single B-26, with a Navy Mark 13 slung under the belly, attacked first. The pilot elected to drop the weapon like a bomb, and ended up missing the Ryujo by 200 yards. Next to arrive were the two old B-17s of the Eleventh, both fitted with radar sets which allowed them to see the enemy despite the terrible weather. Dropping down to low level, the B-17s made individual attacks that failed to hit any ships, but one of the bombers was shot down by anti-aircraft fire. Finally, three more B-26s arrived, again armed with torpedoes. They made runs on the Junyo and Ryujo but, despite claiming the sinking of a ‘cruiser’, managed to hit nothing at all. Manoeuvring his fleet to avoid these attacks had cost Admiral Kakuta time, and he was unable to launch a second attack on Dutch Harbor until the afternoon of the 4th. A strike force of seventeen bombers covered by fifteen Zeros was launched to hit the town again. Whilst the aircraft were en route, Kakuta received a strange message ordering him to postpone the occupation of the Aleutians and take his fleet south to join up with the fleet then attacking Midway. Unable to comply until his aircraft returned, Kakuta elected to wait for amplifying instructions. The strike force arrived over a ready-and-waiting Dutch Harbor an hour after leaving the carriers. All ships had left the port except for the Northwestern, an old troop transport that was permanently aground. She was hit by two bombs but her holds had been filled with concrete to make her more stable, and although she burned for three days the thirty-year old ship survived to provide electrical power to the town for months to come. Other bombs hit the hospital at Fort Mears, a nearby warehouse, and one of the anti-aircraft gun emplacements. Four oil storage tanks were destroyed, and almost a million gallons of fuel began to burn. 18 men were killed and 25 wounded. Eight P-40s from Umnak managed to intercept the Japanese on their way back to their carriers, but succeeded only in losing one of their number to the escorting Zeros. By the time the Ryujo and Junyo planes landed back aboard their ships, Kakuta’s orders to move south had been revoked and he was ordered to continue the occupation of Attu, Kiska and Adak. Realising that Adak was far too close to the American air base on Umnak, he chose to cancel that landing but continued with those on Attu and Kiska. These islands, unoccupied except for small teams at weather stations, fell without loss to the Japanese on the 8th of June. Soon floatplane fighter and flying boat units arrived to defend Kiska from the expected assault by American bombers.